In a small bowl, combine the whipped cream cheese, whole grain mustard, minced chives and Wild Fernleaf Dill Olive Oil. Fill a pastry bag with the filling. Attach a #1M Wilton tip, if you have one. 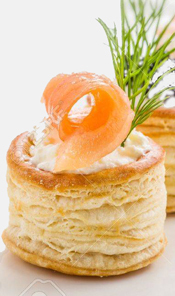 Fill the vol au vent cases with the cream cheese mixture. Roll each piece of salmon into a rose and place in the middle of the cream cheese filling. Garnish with some chives and serve.